Job Source: NCC Bank Web Server. Establish policy guidelines & procedures for Bank based on industry practices to ensure strict compliance in order to protect Bank’s asset by minimizing risk. 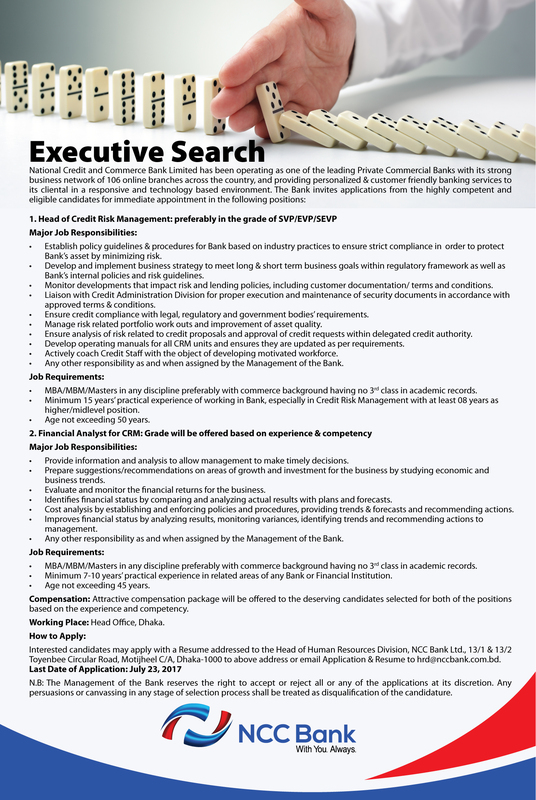 Develop and implement business strategy to meet long & short term business goals within regulatory framework as well as Bank’s internal policies and risk guidelines. Monitor developments that impact risk and lending policies, including customer documentation/ terms and conditions. Liaison with Credit Administration Division for proper execution and maintenance of security documents in accordance with approved terms & conditions. Ensure credit compliance with legal, regulatory and government bodies’ requirements. Manage risk related portfolio work outs and improvement of asset quality. Ensure analysis of risk related to credit proposals and approval of credit requests within delegated credit authority. Develop operating manuals for all CRM units and ensures they are updated as per requirements. Actively coach Credit Staff with the object of developing motivated workforce. Any other responsibility as and when assigned by the Management of the Bank. MBA/MBM/Masters in any discipline preferably with commerce background having no 3rd class in academic records. Minimum 15 years’ practical experience of working in Bank, especially in Credit Risk Management with at least 08 years as higher/midlevel position. Age not exceeding 50 years. Provide information and analysis to allow management to make timely decisions. Prepare suggestions/recommendations on areas of growth and investment for the business by studying economic and business trends. Evaluate and monitor the financial returns for the business. Cost analysis by establishing and enforcing policies and procedures, providing trends & forecasts and recommending actions. Improves financial status by analyzing results, monitoring variances, identifying trends and recommending actions to management. Minimum 7-1 O years’ practical experience in related areas of any Bank or Financial Institution. Age not exceeding 45 years. Working Place: Head Office, Dhaka. National Credit and Commerce Bank Limited has been operating as one of the leading Private Commercial Banks with its strong business network of 106 on line branches across the country. 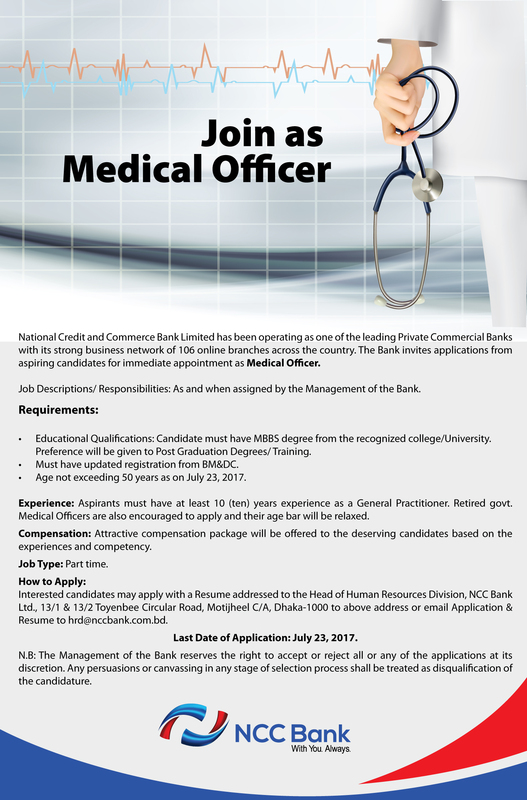 The Bank invites applications from aspiring candidates for immediate appointment as Medical Officer. Job Descriptions/ Responsibilities: As and when assigned by the Management of the Bank. Educational Qualifications: Candidate must have MBBS degree from the recognized college/University. Preference will be given to Post Graduation Degrees/Training. Must have updated registration from BM&DC. Age not exceeding 50 years as on July 23, 2017. Experience: Aspirants must have at least 1 O (ten) years’ experience as a General Practitioner. Retired govt. Medical Officers are also encouraged to apply and their age bar will be relaxed. Last Date of Application: July 23, 2017. N.B: The Management of the Bank reserves the right to accept or reject all or any of the applications at its discretion. Any persuasions or canvassing in any stage of selection process shall be treated as disqualification of the candidature.